When we think of Jonathan Edwards we don't naturally think, "Oh, a devotional with a man who loved and worshiped the Creator!" No. What we think when we hear Jonathan Edwards's name is his fiery and passionate sermon Sinners in the Hands of an Angry God. 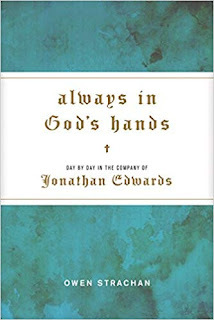 Owen Strachan with this book Always in God's Hands: Day by Day in the Company of Jonathan Edwards gives us a man who didn't just love God or pen the mightiest sermon ever. I have a number of devotional books that I love to read and rotate reading from to get as best insights I can from God's word. But with Owen's work on this devotional I see a different side of Jonathan Edwards. In reading this devotional Always in God's Hands, I see a passionate man whose desire it is, and was, to bring people into the presence of God--not just to experience Him and His mercy--but to show them His wrath remained on them in their sin; that's why he wrote that sermon: Sinners in the Hands of an Angry God. I have heard of Jonathan Edwards in my life, even though he was one of America's first and most famous theologians on God's word. Strachan with this book shows us a man who believed God was "ever-present in each of our lives, caring and encouraging us in every moment." Scripture calls every man who teaches Gods word to "comfort yourselves together, and edify one another, even as also [you] do" (1 Thessalonians 5:11, King James). After reading a number of daily devotionals from this delightful book from Jonathan Edwards life I can honestly say it is one I will treasure as well as read and re-read numerous times. My hope and prayer is that you, the reader, take the opportunity to pick up a copy and see for yourself if it's something worth treasuring as well as God's Word, the Bible. I received this book complimentary from Tyndale in the hopes of honest feedback as well as to give an unbiased review.